This was something of an unexpected battle. Mostly because I wasn’t aware that any place in Melbourne served cha ca thang long other than Sapa Hills, but also, because I didn’t expect to have it twice on consecutive nights! 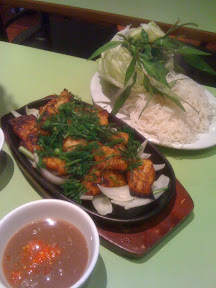 Cha ca thang long is a Northern Vietnamese grilled fish dish, which is often hard to find outside of Viet Nam. 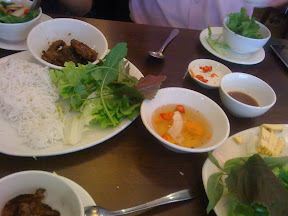 Most of the Vietnamese food we get here in Australia is of the Southern Vietnamese style. I think this has a lot to do historically with migration patterns, and the fact that a large proportion of Vietnamese refugees who settled here after the Viet Nam war were from Southern Viet Nam. In any case, Sapa Hills became quite popular after opening just over a year ago, with glowing reviews in the mainstream media, and being that ‘little bit different’ by serving a menu which is heavily influenced with Northern and central style Vietnamese dishes, like bun cha and of course, cha ca. What I, and I assume most other people, didn’t know was that there are other Vietnamese places around, with just as interesting and diverse menus on offer. Such as Dong Que, a few doors down from Sapa Hills. I had been to Dong Que once before, and was rather uninspired by the food. But when @eatnik and @meatnik declared that they were in the mood for banh xeo, I had to admit I was at a loss as to where we should go in Footscray. I guess I’ve been blinkered somewhat by my lust for soup noodles – namely pho and bun bo Hue – since I moved to Footscray, and I haven’t really been testing out the other staples of Vietnamese cuisine in the ‘hood. So as we walked along Hopkins St, Dong Que god the nod by default, because it was the first place with pictures of banh xeo in the window. 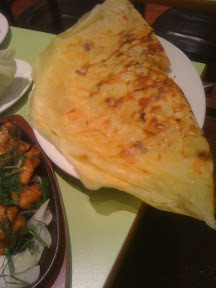 When it arrived, the banh xeo didn’t disappoint. Not too oily, and wonderfully crisp around the edges, the ‘crepe’ was laden with bean shoots, mung beans, belly pork and shrimp. A great version of what a banh xeo should be, in my opinion. The only thing I would say is that they could have used a touch more turmeric and coconut milk in the crepe batter itself. But I’m nitpicking here. 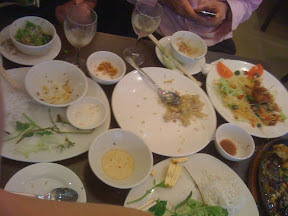 Oh, and don’t let the picture fool you – that’s a big plate, and the banh xeo was even bigger! On @msbaklover‘s recommendation, we also ordered the banh dap thit nuong – steamed rice paper with grilled pork, sandwiched between rice crackers. 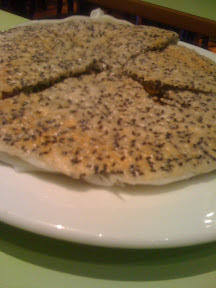 It’s like a crunchy Vietnamese quesadilla! 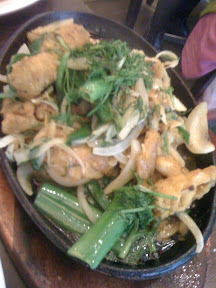 Although this was an interesting and fun dish to eat, I wouldn’t want to have one on my own; definitely a dish to share. 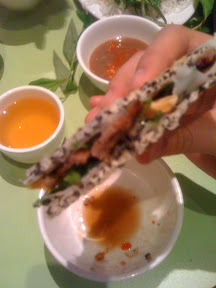 The grilled pork was tasty, if a touch dry, but the sticky rice paper added a moistness to it, which was necessary, given the other ingredients were the rice crackers, some crushed peanuts, and spring onion. The overall cracker-sandwich nature of the dish made it feel more like a snack than a meal. Though again, not in size, because the portions at Dong Que are nothing if not generous. But on to the main event – the cha ca! Arriving on a sizzling plate, the fish was beautifully grilled, with just a touch of crunchy char to the edges, and you can see the hefty use of turmeric and dill, the two signature flavours of cha ca. Served with a good amount of rice vermicelli and fresh herbs and lettuce, I’d happily devour a dish of this on my own. The mam (fermented anchovy) dipping sauce was a good balance of salt, acid and pungent fishiness with a hint of sweetness. This sauce isn’t for everyone – due, obviously, to the pungent fishiness – so ask for the regular fish sauce (nuoc cham) if you like to play it safe. The next night, I caught up with Mr I and Ms D. Both of them had read another recent review of Sapa Hills, and wanted to try it out. Never having been myself, I heartily agreed. Living in Footscray, and eating a lot of Vietnamese food, leads me to often look through the menu for something which isn’t often found at other restaurants. At Sapa Hills, this meant there were quite a few attractive options. First up, we ordered the bun cha. While this is similar to the Southern bun thit nuong in that they’re both dishes composed of rice vermicelli, grilled pork, with lettuce and herbs, bun cha is a notably different dish. The grilled pork comes in two forms; little mince patties, and thin slices of pork belly. Both are on the salty side, but that’s because you’re supposed to pair it with the sweetness of the nuoc cham and the fresh lettuce and herbs. Sapa Hills’ version was pretty good, though you should eat it quickly, because the meat is quite fatty, and gets a bit greasy as it gets cold. Mr I particularly liked the little minced pork patties. I was looking forward to the cha ca, despite having had it the previous night, because I’d heard a lot about Sapa Hills’ rendition. To be completely honest, I was disappointed. The fish was a bit on the bland side, and lacked any sort of delicious charred-ness. The overall result was that texturally, the dish was soggy and limp. Not attractive. There was a good amount of dill, but the turmeric seemed to have been tempered somewhat, which was disappointing. 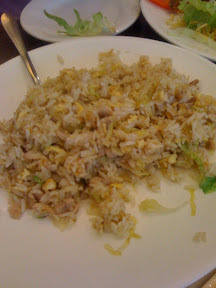 We also ordered the chicken and salted fish fried rice, which was quite good! Tasty, not too oily, and I love it when people cook lettuce, so points for that. I would have liked a little less chicken and a little more salted fish, though. When ordering the two dishes and a fried rice, we thought we could probably squeeze in an entree, so we ordered the soft-shelled crab to share between the three of us. It arrived after all of the other dishes. Oops! It was, however, quite good. 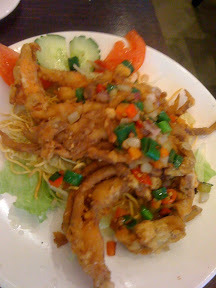 Not the best soft-shelled crab I’ve had – the batter was a little heavy, and the seasoning was overly salty – but a decent effort, and it certainly would have whet our appetites, had it not arrived after all of the other dishes. So when it comes down to it, both restaurants have their strong points, and there are many reasons on both menus that call for return visits. 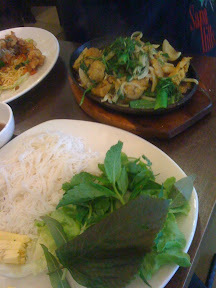 But when it comes to the crunch, Dong Que’s cha ca was streets ahead of Sapa Hills’, in my opinion. Also, as you know, I agree with your assessment of why there are more southern Vietnamese restaurants in Melbs, and would add that it's also why many have Chinese/Vietnamese menus, because as you also know (but others might not), many of those who fled in the '70s and early 80s were Chinese Vietnamese and still very connected to the Chinese foodways (usually Cantonese, to my understanding). YUM YUM!! Cooked lettuce has really grown on me – I used to really dislike it but it is yummy. 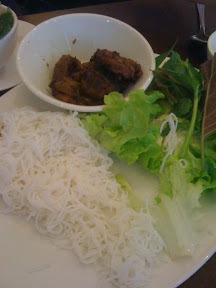 Love salted fish rice as well as vermicelli. To be fair, I should always use diacritics when I write Việt Nam, and according to my own inconsistent style, I should probably be italicising. Because Viet Nam is how it's written in Vietnamese. There are no two syllable words in Vietnamese, because it shares roots with Chinese, (I think?) and therefore each syllable is a word in its own right. Hence I'll usually remember to write Ha Noi and Sai Gon, as well. So I guess it's a style thing, in the end. I'm writing the name in Vietnamese, not English. See wikipeadia for more details about the etymology.